Gait disturbances are among the most incapacitating symptoms in Parkinsonism syndromes because they are often refractory to medical and surgical treatments [1, 2, 3]. 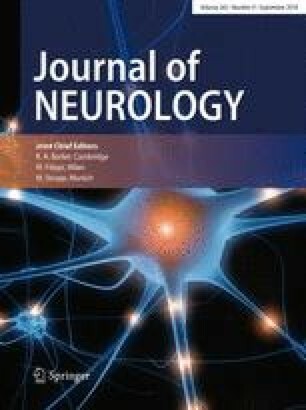 Primary progressive freezing gait (PPFG) is a neurodegenerative atypical Parkinsonism disorder, initiated with start hesitation, episodic inability (lasting seconds) to generate effective stepping, leading to freezing of gait (FOG) without other neurological abnormalities within the first 3 years, and eventually postural instability, and falls. It is usually coupled with bradykinesia, rigidity, and levodopa resistance [1, 4, 5, 6]. We report a case of PPFG which experienced a dramatic improvement to the use of a laserlight visual cueing device (LVCD). The online version of this article ( https://doi.org/10.1007/s00415-018-8966-9) contains supplementary material, which is available to authorized users. We wish to thank the patient and her family for their cooperation regarding this report. We obtained written informed consent from the patient’s son for this publication. This single case study has been approved by our Institution’s Ethics Committee and have, therefore, been performed in accordance with the ethical standards laid down in the 1964 Declaration of Helsinki.